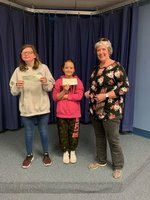 Congratulations to 2nd place winner Summer Greene and 3rd place winner Haley Bloomer in the Hawkins County Farm Bureau Essay Contest sponsored by the Hawkins County Farm Bureau Women's Committee. Students were tasked with completing an essay to explain why agriculture was important. Congratulations to Mr. Seth Rhoton and Mrs. Brittney Rhoton for being selected to attend Energy Camp! Congratulations to Summer Greene and Haley Bloomer Congratulations to Mr. Josh Lawson for being nominated as Clinch School's 2018-2019 Teacher of the Year! Congratulations to Mrs. Denise McKee for being recognized as the 2018-2019 Principal of the Year for Hawkins County Schools! Clinch School Celebrated Homecoming Week! Congratulations to Clinch School from Commissioner McQueen Clinch School's Reward School Celebration!